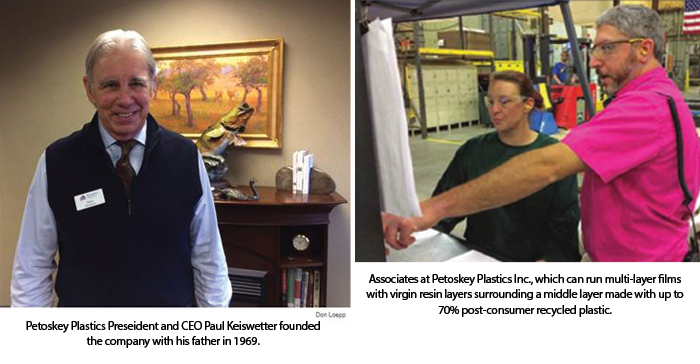 Petoskey, MI: Petoskey Plastics was named one of four finalists for the Plastics News Processor of the Year Award for 2016, which is sponsored by the Plastics Industry Association. Petoskey Plastics is the only blown film company among the finalists. The winner will be announced in March. Plastics News is a weekly, 46,000-circulation trade newspaper delivering global news to a primarily North American market. Founded by Crain Communications Inc. in Akron, Ohio, in 1989, it covers the business of the global plastics industry. Petoskey Plastics is an environmentally focused recycler and plastic film, bag and resin manufacturer providing superior products and solutions. Headquartered in Petoskey, Michigan, the company provides products and engineered solutions for a variety of industries including automotive, industrial, institutional, retail, construction and home improvement. Petoskey Plastics has facilities in Michigan, Indiana and Tennessee. Learn more at www.petoskeyplastics.com.